Shiny Palkia in game: 338 Who? Important notice! 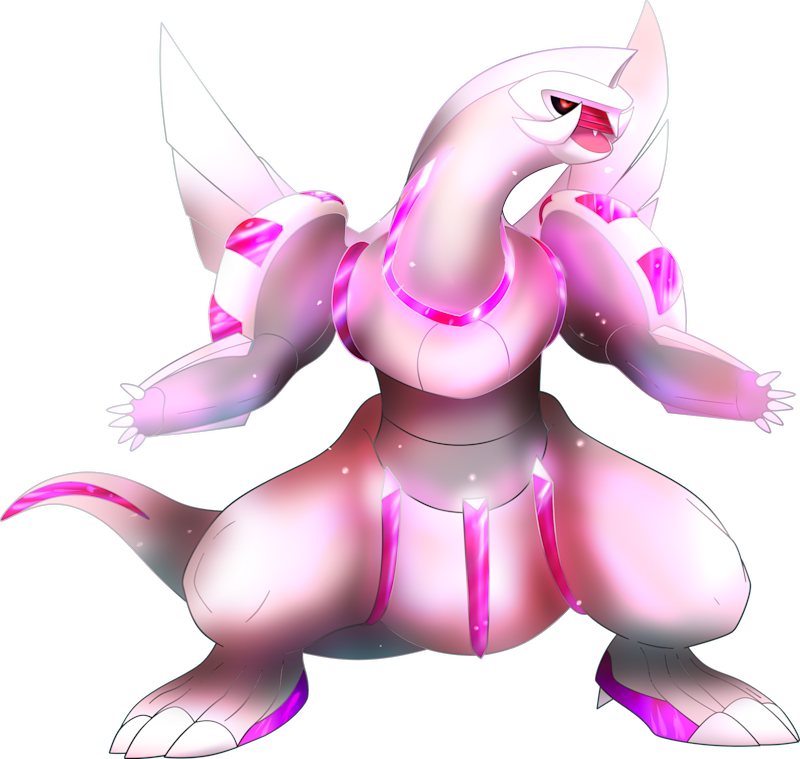 Pokemon Shiny Palkia is a fictional character of humans. 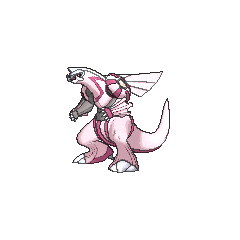 Palkia (Japanese: ???? Palkia) is a dual-type Water/Dragon Legendary Pokémon introduced in Generation IV. Palkia is the game mascot of Pokémon Pearl, appearing on the boxart. Along with Dialga and Giratina, it is a member of the king trio of Sinnoh, representing space. 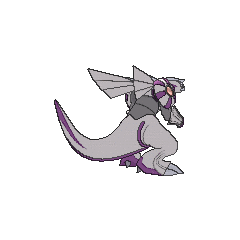 Palkia is a light purple theropod-like Pokémon with stripes and markings of a darker shade and gray underarms and waist. It has round purple-striped plates on its shoulder area, where two pink pearls lie encrusted with a gray rim encircling them and fins in their back. 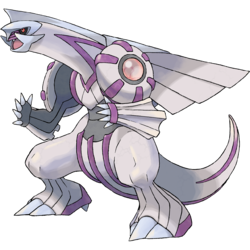 Palkia’s arms have extended formations resembling gauntlets and a purple band around each wrist. Palkia has a long neck, a pointed white crest on the top of its head that extends to its wings, two strong horn-like tusks on the sides of its jaw, and a powerful tail. As seen in Pokémon Mystery Dungeon: Explorers of Time and Explorers of Darkness, Palkia travels by composing a large yellow sphere from its two pearls, then using it to fly very fast. Palkia has the ability to warp space. Palkia lives in a different dimension, making its behavior nearly impossible to study. However, Palkia has been seen in violent conflicts with its counterpart, Dialga. It has been known to be very protective of its home as well. Palkia is the only known Pokémon that can learn Spacial Rend. Palkia appeared in the first three Diamond & Pearl series Pokémon movies. It was first shown in The Rise of Darkrai, where it fought with Dialga and Darkrai in a battle that nearly destroyed Alamos Town. It was shown in a flashback in Giratina and the Sky Warrior. Palkia's final movie appearance was in Arceus and the Jewel of Life. It was shown for the first time with both the other members of its trio, and started a battle with them which awoke Arceus. Palkia had a major appearance in The Battle Finale of Legend!, in the conclusion of Team Galactic's plot at Mt. Coronet. 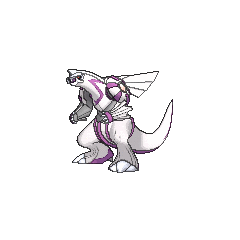 It is unknown if this is the same Palkia as that in the movies. Palkia appeared in the second XY series movie, Hoopa and the Clash of Ages, as one of the many Legendary Pokémon summoned by Hoopa. Palkia made its debut in A Secret Sphere of Influence! in a fantasy. Palkia made a brief appearance in Meowth's fantasy in For The Love of Meowth!. Palkia appeared in The New World along with Dialga. Both of them were captured at Spear Pillar by Cyrus, who intended to use them to destroy the world and build a new one. Along with Dialga, it was freed by Giratina before they could help Cyrus succeed in his goal. Palkia debuted in The Rise of Darkrai manga adaptation fighting Dialga. In the Arceus and the Jewel of Life manga adaptation, Palkia, along with the members of its trio, were summoned by Sheena to help Ash and his friends. Palkia soon engaged in a battle with the other members of its trio with Arceus. Palkia, along with Dialga, was summoned by Cyrus in the Diamond & Pearl chapter in order to build a new world. Cyrus used the Red Chains to force Dialga and Palkia to fight each other in order to distort time and space and build a portal that would swallow the existing world. Diamond, Pearl and Platinum worked together with their Pokémon to free Dialga and Palkia from their controlled states. Later on, an accident with handling Charon's machine caused Dialga, Palkia and Cyrus to be dragged into the portal before it closed completely. In the Platinum chapter, it was revealed that Giratina imprisoned both Dialga and Palkia in the Distortion World before setting off into the current dimension to wreak havoc. Soon, Cyrus and Diamond met in the Distortion World, and agreed to free Dialga and Palkia using their Pokémon. Dialga and Palkia later resumed their struggle against Giratina in the Distortion World. When Charon decided to escape from the Distortion World on Giratina, Pearl got on Palkia and chased after him. Giratina was eventually defeated, with Dialga and Palkia forcing it back into the Distortion World for good, before both returned to the Spear Pillar. 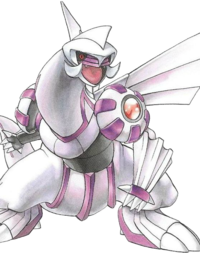 In the HeartGold & SoulSilver chapter, Palkia was breed in the Sinjoh Ruins, along with Dialga and Giratina, by Arceus' breeding process, which was forced by Team Rocket's Four Generals. Knowing that the breeding process would threaten the Johto region, Team Rocket's true leader Giovanni returned with Lance and Pryce to keep the breeding trio at bay while Gold tried to calm Arceus down. Palkia was kept at bay by Lance and his Dragonite. Once Arceus was eventually becalmed, Dialga and Palkia departed from Johto and were spotted by Cynthia. Palkia appeared in The Advent of the Legendary Pokémon!! as a silhouette. It officially debuted in Will Hareta's Wish Get Through?!. Palkia, along with the members of its trio, appeared in PBK5 where it fought against Shin's Abomasnow and Mamoswine and defeated the latter. It fought against Yu Shirogane and lost. Palkia debuted in PMDP14 of Pocket Monsters DP. A Palkia appeared in PMDP26 under the ownership of Kazuki. Another one appeared in PMDP29. 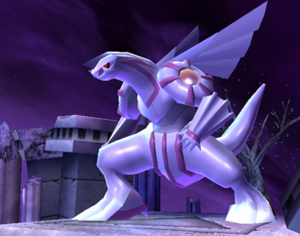 Palkia occasionally appears on the Spear Pillar stage as one of three Pokémon that controls it. It only appears on the stage when the ground on the upper levels have a purple tinge to them. Unlike Dialga and Cresselia, it'll use its powers to distort the stage however possible. Some examples include tilting the stage, turning the stage completely upside down and reversing the screen itself (the last two will cause the movement controls to be reversed temporarily). It often shoot beams in the cave below, dealing a lot of damage to the players that get caught in the blast. "A Spatial Pokémon. In the Sinnoh region, this Pokémon has been revered for many generations, much like Dialga. Dialga warps time, but Palkia has control over space. It lives between parallel dimensions and is known for its power, rumored to be able to warp space. It can use Spacial Rend to rip through the very space an enemy resides in, damaging the foe at the same time. It is Pearl's mascot." Palkia appears as a Pokémon released from a Poké Ball. It will use Spacial Rend, which will flip the stage for a time, and can cause damage. Palkia also causes damage on contact. NA: Stories surround this Legendary Water/ Dragon-type Pokémon. Its Spacial Rend attack will tear space and flip the screen upside down. When this happens, the left and right controls of the fighters will become flipped as well. Pokémon Mystery Dungeon: Explorers of Time and Explorers of Darkness: Palkia plays a major part in the game's post-story. Pokémon Ranger: Shadows of Almia: Palkia appears as a bonus boss during one of the Ranger Net extra missions. Palkia was injured from a battle with Dialga and entered Hippowdon Temple. In its pain, it warped the space of the Almia region and caused all of the locations of Almia to be shuffled together. It has the ability to teleport in space. It is said to live in a gap in the spatial dimension parallel to ours. A legendary Pokémon of Sinnoh. It can transport itself to faraway places or even other dimensions. Moves marked with a superscript game abbreviation can only be bred onto Palkia in that game. It controls spatial dimensions and blasts a powerful beam from its mouth. It rends space to attack. 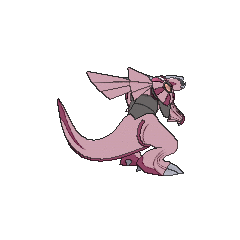 For other sprites and images, please see Palkia images on the Bulbagarden Archives. In games prior to Pokémon Omega Ruby and Alpha Sapphire, Palkia has a catch rate of 30. The gems on Palkia's shoulders resemble Pale Spheres. Although Palkia is genderless in the main games, it is referred to as a male in Pokémon Mystery Dungeon: Explorers of Time and Explorers of Darkness. Palkia is in the highest IQ group. It takes this position in IQ group J and is the only Pokémon in IQ group J. In Pokémon Mystery Dungeon: Explorers of Time and Explorers of Darkness, Palkia, along with Primal Dialga, the Legendary titans, the Magnemite family, and Regigigas, all speak in all capital letters, unlike the other Pokémon in the game. Appearance-wise, Palkia is likely based after a European dragon combined with a pearl. Its appearance may also be derived from the Plateosaurus or other bipedal dinosaurs such as the Oviraptor. Palkia is derived from the Japanese spelling of pearl, ?—? paru.